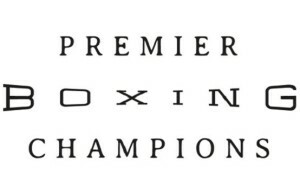 The oldest one in the book in boxing is “styles make fights”, so what happens when you take an old-school guy who lunged and leaped and generally had no concept of positioning if it meant delivering a power shot and put him in against one of the most fundamentally sound straight-up boxers of all time? We find out tonight with a middleweight contest, as Tony Zale gets in the time machine fresh off his last win as a professional, a three-round drubbing of Rocky Graziano in the rubber match of their three-fight series in 1948. He steps in against Gene Fullmer, who gets in the time machine fresh off the 1957 Fight of the Year, his 14th-round stoppage of Carmen Basilio in their first fight. Our co-feature tonight is a welterweight tilt between Jose Napoles, the great champion at welterweight when Sugar Ray Leonard was just a boy and Roberto Duran was still a lightweight, taking on Felix Trinidad. Both men come in off big knockouts; Napoles gets in the time machine fresh off a three-round beatdown of Horacio Saldano in 1974, while Trinidad comes in from the Larry Barnes fight in 1995, a four-round smackdown for the ages. Short of the 8-bit version of Mike Tyson in his Punch-Out video game, has anyone ever thrown a more devastating uppercut than the one Jose Napoles unleashed? He was that rare combination of a guy who could throw a traditional uppercut with the power hand and a lead uppercut that could hurt an opponent just as bad and twice as quick. Meanwhile, Tito would just beat you up the regular way. As a nearly six-foot welterweight, Trinidad had a Tommy Hearns-like ability to tower over his opponents, although unlike Hearns, Trinidad didn’t have the freakishly long arms and 78-inch wingspan. On the tale of the tape tonight, Napoles is 5’7” while Trinidad stands six feet, but Trinidad’s reach is only two inches longer, 74 inches to Jose’s 72. 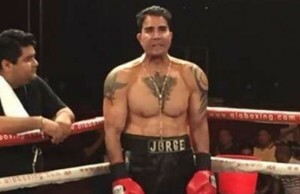 Napoles was Cuban by birth, but his adopted home of Mexico makes this a classic example of the good old rivalry between Las Aztecas y Las Boricuas, and referee Benjy Esteves will have his hands full tonight when the fight moves to the inside. Trinidad, respecting his opponent’s ability to throw the uppercut in close, started this one on the outside, using his height and his reach with the clear intention of keeping Napoles off him. Napoles, adjusting, looked to get in behind his jab before working the trailing uppercut with the right hand delivered short to the body of Trinidad, intending to wear him down over the course of the twelve-round fight. The stage was set for the initial chess match, and Trinidad, who was always a little too easy to hit with the jab—Larry Barnes landed a few jabs smack on the kisser of the Puerto Rican—found himself at a range with which he was less than comfortable, forcing him to tie up on the inside. Such was the timbre of the first round—Trinidad would jab, Napoles would jab, Trinidad would get hit, and the fighters would clinch. It wasn’t exactly thrilling, but neither guy was looking to thrill anyone. They had a fight to win. Trinidad’s chin was always a problem for him. Oba Carr, Luis Campas, and Anthony Stephens all dropped him early in his title run, and Bernard Hopkins flat-out wrecked him in the 12th round of their middleweight title fight in 2001. Which is to say that when Napoles feinted with the jab and forced Trinidad out of position in his efforts to attempt to brace himself for the assault on the inside, it was as though the gods had pre-ordained what would happen next. Instead of throwing the trailing uppercut, Napoles instead went in with the lead, and Trinidad took it right on the chin, reeling backward and trying desperately to shake off the punch while the Mexican went on the attack. Trinidad’s best efforts went for naught, however, as a jab-right uppercut-left hook three-punch combination followed by a vicious straight right hand sent Trinidad to the canvas and Esteves into a count. Trinidad rose at the count of seven with a minute and a half left in the round, and Napoles began to unload, landing the jab at will and moving inside to do more body work, this time unimpeded by an opponent with his wits about him. Desperate, Tito grabbed on and, showing his other weakness as a fighter from his career, lost his cool and threw a filthy rabbit punch with his free hand in the clinch. Esteves saw it and immediately separated the fighters, calling time and deducting a point. The situation had gone from bad to worse, but Napoles, hurt by the cheap shot, broke off his all-out assault for long enough to turn what might have been a second-round TKO into a 10-7 round and Trinidad living to fight another three minutes. Napoles, content to resume his game plan of jab, move inside, hit to the body and dig with the uppercut, spent the next three rounds doing exactly that, the action only occasionally interrupted by Trinidad’s successful attempts to use his own jab to keep Jose off him. As the fight entered the middle rounds, the press row scorecard saw this one 50-43 for Napoles; Trinidad was in trouble. In between rounds, the commentary team brought in Carlos Palomino, who shared an anecdote of sparring with Napoles back in the 1970s and mentioned that Napoles was one of the hardest punchers he ever shared a ring with. 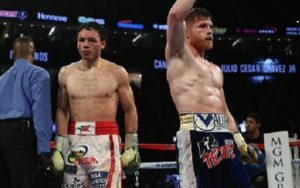 Fans may not have needed that bit of insight in light of what they’d witnessed so far, but the endorsement reinforced the image the fans saw in the ring as the sixth round began. Trinidad began to get desperate as he again found himself in a bad place, withering under the assault of the champion from forty years in the past. Again, Trinidad, looking for any angle, held on, except this time, with a minute and 45 seconds to go in the round, when Esteves broke the clinch, Tito threw a hook that just grazed the face of Napoles. 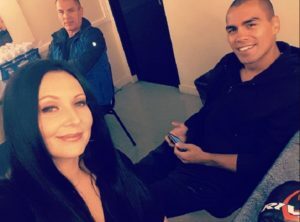 The punch did not do any damage, but Esteves, furious, again called time, and again he deducted a point, saying in no uncertain terms that this was Tito’s last warning. Napoles, no worse for wear but frustrated in his own right by the dirty fighting of his opponent, began to up the pace of his attacks, this time doubling up on the jab before moving in, landing two for the price of one and varying the timing such that he had Trinidad guessing where the punches would come from. 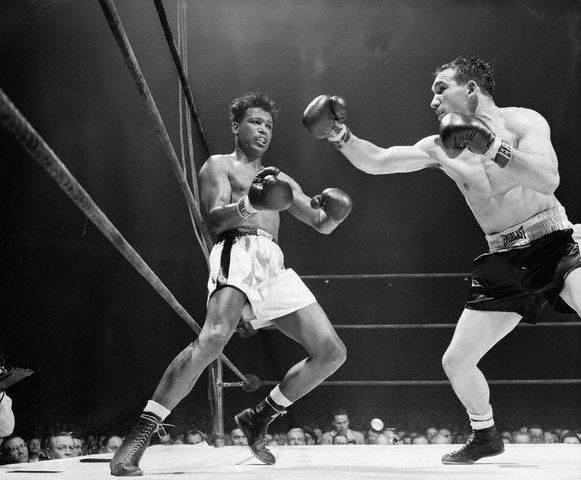 Did you know that Carmen Basilio was involved in five consecutive Ring Magazine Fights of the Year? It’s true—in order from 1955 to ’59: Tony DeMarco, Johnny Saxton, two fights with Sugar Ray Robinson, and finally the fight with Fullmer. Meanwhile, Zale was himself involved in three straight Fight of the Year contests, against Rocky Graziano in 1946 and ’47, and the third fight with Graziano probably would have won the nod in ’48 but for Zale’s undoing at the hands of Marcel Cerdan later that same year. Zale is not fighting Basilio this week, however—we’re saving the Upstate Onion Farmer’s Historical Fight Night debut for next week, and it’s going to be a hell of a matchup heard ’round the world. But that’s later. For now, it’s one of the most exciting fighters of the 1940s taking on the guy who finally ended Sugar Ray Robinson’s run as a championship-level fighter in 1961 (Robinson would fight on for another four years, but never again for a title.) Gene Fullmer is today put in the time machine from that 1959 contest with Basilio, a 14-round somewhat questionable stoppage but nonetheless a fight that was an absolute clinic on how to break an opponent down with perfect boxing. It’s funny how you look at some of the old-time fighters and you think to yourself “they’d get clobbered if they fought like that today.” The guy Zale reminds the modern fight fan of the most sometimes is Naseem Hamed, about whom Jim Lampley said “not only has he not read the book on boxing fundamentals, he hasn’t even read the table of contents.” Zale’s idea of “giving angles” was to throw punches from so far out in left field that a baseball landing near them would be ruled a home run. Sure enough, right from the opening bell, Zale did what Zale does, hanging out on the outside, coiled up like a snake, and when Fullmer came into punching range, Zale would spring in with a lunging power shot. For Fullmer, this meant a lot of patience and defense early, as he watched, learned, got a sense of how to time Zale. He ate a straight right hand and an uppercut, but that was out of nearly a dozen exchanges; he otherwise stayed at range, pawed with the jab, and measured his opponent, a measure that was, as it turned out, the equal of his own in height and reach. Zale, to close distance, would have to come from too far away to too close in one fell swoop. Which led to a shot that would’ve done Luke Skywalker proud. When Zale lunged in with 45 seconds to go in the round, dropping the left and springing with the right, Fullmer sidestepped him as adroitly as a matador sidestepping a charging bull, then with perfect precision uncorked a left hook right behind the ear of the “Man of Steel”, and just like that, with a single punch, the lesson was learned: Fundamentally sound boxers will beat the wild swingers every day and twice on Sunday. “Cyclone” hit with Category 5 force, and referee Mills Lane stopped the fight without a count. 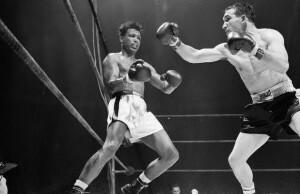 Zale would return to his own time, get knocked out by Marcel Cerdan, and call it a career. You don’t lose 17 times, even in the old-timey days, without some fundamental and exploitable flaw, and by the same token, you don’t get to 50-4, even in the old-timey days, without being one hell of a great fighter. Not for nothing is Gene Fullmer regarded as at least top ten and possibly top five all time in the middleweight division, decisively trailing only the likes of Hagler and Monzon and Greb and Robinson. Turns out we’ve got a couple of fighters reading and enjoying the column, and I’ve had the pleasure of interacting with both on social media, so Carlos Palomino and James “Quick” Tillis? It’s your time to shine, boys. 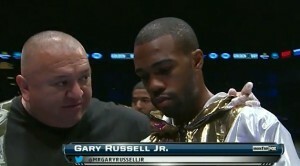 But not against each other—putting a welterweight in against a heavyweight would be dirty pool on my part. Instead, you get one monster of a main event, as Palomino takes on none other than the Upstate Onion Farmer, Carmen Basilio, in the main event. Basilio made a hell of a name for himself at middleweight, but you’re getting the 147-pound version of the man, fresh off his win over Johnny Saxton in the 1956 Fight of the Year. Palomino gets put in the time machine after throwing one of the greatest left hooks boxing has ever seen, the one that hit Dave “Boy” Green and put him out for the count in 1977. Your co-feature showcases Tillis, put in the time machine in 1982 fresh off his win over Earnie Shavers, and at the high point of his career record-wise—he was 22-1 at that point—matched up against Scott LeDoux, who comes into the time machine after getting absolutely robbed and settling for a draw against Ken Norton in 1979. And hey, if you want to know how the sausage is made and get a look behind the scenes at Historical Fight Night? All it’ll set you back is a three-dollar monthly donation on Patreon. The money goes toward helping to make this a better show each week; the single best way to support a writer is directly, since it unhooks my earnings from the fickle nature of ad revenues. Be a champ and get access to some goodies while you’re at it. As always, thanks for reading, and see you next week, 6 Eastern, 3 Pacific, right here on Historical Fight Night.